Preheat oven to 375 degrees F. In a bowl, mix together the onion, zucchini, carrot and garlic. Adds the oil, season with salt and pepper, to taste, and toss to combine. 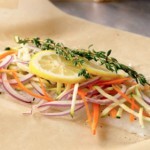 Put each fish fillet in a large square of parchment paper and season with salt and pepper, to taste. Arrange the vegetables on top, dividing evenly. Top the vegetables with 2 lemon slices, 2 sprigs thyme, a pat of butter and 1 tablespoon white wine, layering in order. Fold the parchment paper around the edges tightly in 1/4-inch folds to create a half moon shape. Make sure you press as you crimp and fold to seal the packets well, otherwise the steam will escape. Arrange the packets on a baking sheet. Bake until the fish is cooked through, about 12 minutes, depending on the thickness of the fish. To serve, cut open the packets and serve directly in the parchment on a plate or remove the fish to the plate using a spatula, being sure you don’t leave the juices behind.